Growing up in the ultra competitive New England area that has produced stars such as John Dowd, Doug Henry, Tony Lorusso and Mike Treadwell, to name a few, Robby Marshall has always been known for his prowess in the sand. The veteran from Massachusetts shines at his home track of Southwick, yet has continued to prove throughout his career that he’s more than a one trick pony. 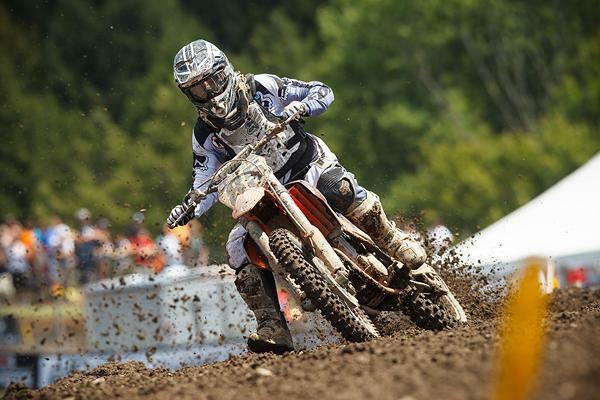 A late season pick up by the Munn Racing/Ankle Savers KTM team, Marshall excelled down the stretch run in 2012. With the off-season musical chairs still in full flux, we caught up with Marshall to talk about his season that was and his plans for 2013. Racer X: After signing with Munn Racing/Ankle Savers KTM late in the season you really broke out, not only at your home track Southwick, but at Unadilla and Steel City as well. If you had to grade your season, what would it be? Robby Marshall: It was good; I think I learned a lot. It’s kind of crazy how long I’ve been doing this and how every season I learn more and more. We all learn so much each race. You hear Reedy [Chad Reed] and those guys talk and they talk about the same thing—how much they learn every race. I just tried to learn from each race and pushed forward and really tried to stay healthy. When I started the season I told myself, "I didn’t care if I got tenth or fifth or first or didn’t even qualify." At the end of the day if I was healthy it was an alright day in my book. Yeah, and you are probably one of the few riders that can say they escaped 2012 healthy. You mentioned that you learned a lot this year. What was one of the main things you took away from this season? I learned more about preparation more than anything. In the past it was more about me choosing the social life over putting the work in. But this year I put all of that aside and said this is my last year that I’m really going to go for it on my own, and the only thing I can to do to be prepared is to be physically and mentally in shape. There was support there throughout the year, I have a really good program with everyone that I’ve been with forever—KTM, MotoFit KTM, Fox and Spectro—all of the sponsors that have been with me since I was 16 years old. But the Nationals are a whole different level. If you want to get in there and mix it up, it’s hard to do it on a stock bike when you’re putting on parts the day of the race and trying them out in the first practice. I still fought with some bike stuff, but I really came in prepared and tried to have fun at the races and did the best I could at each race. 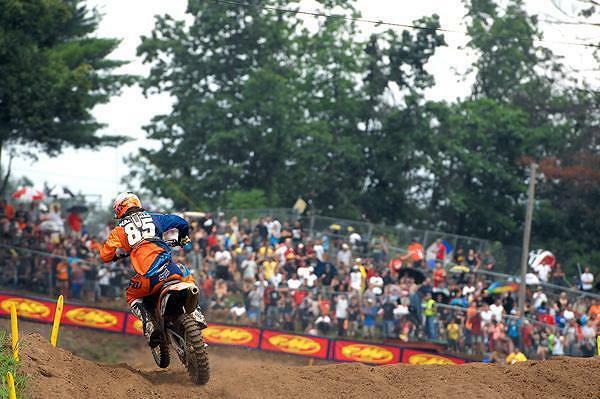 Marshall conquered the sands of Southwick again in 2012, finishing fourth in moto one. Let’s transition to next year. As of right now, do you have anything lined up? No, not yet. There are some deals floating around, but the sport is a lot different that it use to be when riders were signing in June for the next year, and now sometimes it comes up to the day before Anaheim. Right now I trying to stay on the program I’m on and if something comes up I’m more than happy to put every amount of effort and work and desire to get it done the way I know I can. But if the support doesn’t come, I think I will only be riding the local races next year. Hypothetically, let’s say you do get some support. Is a full supercross season in your plans? Oh, yeah! The whole thing I told myself and Cory Duplease, the guy who’s been managing me, is that I’m not racing without a deal with salary and expenses, and the willingness to put in the work with testing and be prepared to do every single supercross and motocross round. I have some really loyal sponsors right now that have been with me forever, and to burn those bridges to do half a season is not worth it. There’s a lot to be said about loyalty in this sport and I would stick with them and do local races, but if someone wants to step in and put me on a program I know I have the ability and the drive to battle for top spots. How long has it been since you’ve done a full year of supercross? I’ve actually never done a full season. The most I ever did was in 2007 when I did four or five out of the seven East Coast Lites series. I ended up getting hurt, but it all came down to me not being prepared. Whether I had the bike or the conditioning, it was always one thing was there and one wasn’t. I never put the whole puzzle together. I definitely missed a lot of opportunities when I was younger, but I feel that you learn from your mistakes and have to put your best foot forward. And you will be getting an early jump on supercross by racing the Montreal Supercross. Matt Goerke will be there to defend his title, along with some fast Canadians. What are your expectations going into the event? It’s a lot different for me now that I’m doing it on my own. I want to go and have a good time. I did that last year and ended up getting third and it was pretty good. I think I can definitely battle for the win, but as long as I’m having fun and leave healthy it will be a good day for me. You’re not really taking your foot off the gas after that, either. You have some big races in Texas coming up as well; can you elaborate on what you have planned? Yeah, there are a lot of money races around. There is actually one down in North Carolina in a few weeks at Hog Heaven and its 1000 dollars per moto and it’s a sand track so I will be there. There are a couple of big races in Texas that Munn [Racing] has a foot in, so I’ll be there. I really enjoy doing these local races, because there’s not nearly as much pressure. I can show up on stock equipment and compete, and in the Nationals it’s almost impossible to do that. It’s good, you make some money, have fun and it’s just a good day of racing like when you were growing up. And when you can make 4000 dollars doing it, it’s definitely okay in my book! Marshall is still looking searching for a ride for the 2013 season. You grew up in the New England area, an area that continues to produce top riders. How much did that competition help you achieve the success you’ve had thus far in your career? The New England thing is really a lot different than people think it is. We definitely don’t have the same tracks as the rest of the country has. You go down south and out west you have some really challenging tracks that are really hard packed and clay and what not. New England has a little easier tracks and a lot softer dirt. But the series’ up there are like nothing like anything else in the country. There are six or seven series that race up there every single weekend. Growing up and racing against guys like Dowd, Lorusso, Johnson and Treadwell, it’s a real benefit to be 16 years old in the A Class and those guys are your competition every week. It’s an every weekend thing up there, where as a lot of other places across the country you just race here and there. Thanks again, Robby. Who would you like to thank for helping you out this season? I have to put huge thanks in to KTM; they stepped up huge this year. Also, MotoFit, Spectro Oils, Fox, Tss Graphics, WP, ICW, South of the Border, MotoNewEngland.com, Spazztic Race Co, Crow Hill MSP, and KTM. With special thanks to Munn Racing KTM/Ankle Savers team powered by EBR performance.